Of course, it wouldn't be Thanksgiving without leftovers and while this recipe may not have been intended for this purpose, I think it suits it just fine! The author has highlighted how easy it is to prepare before and heat the next morning. So, why not! Give it a try! In the morning (or at lunchtime or dinnertime), you just spread the hash in a big baking dish, crack a few eggs on top and slide into the hot oven. 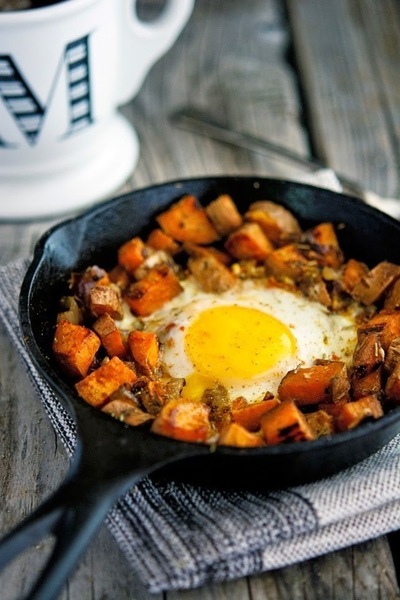 When you come back, the sweet potatoes will be hot and crisped, the onions fragrant, and the eggs perfectly baked. The whole kitchen will smell amazing, and you’ll be ready to serve a crowd. Nourishing, delicious, comforting, and so easy. You can add some protein (e.g., sausage) if you feel like. Personally, I think it’s great as it is. I leave it up to you though.